One of my earliest memories is of a trip with a friend and his father to the shore of the River Humber in England. It was twilight and, along with thousands of other people, we tried to position ourselves comfortably on the rocks so that we could watch the famous yacht go by. The yacht was the Royal Yacht Britannia. On board were the Queen and Prince Philip who were returning from a royal tour. Those tours were frequent back then – often to faraway places like Australia and New Zealand or one of the islands in the South Pacific. I don’t remember where they were returning from on this evening, or why they were sailing up the River Humber. I remember having a brief look through binoculars, but the yacht was just too far away. There’s been hundreds of royal tours since then. The latest in the news is actually the first tour of the new Duke and Duchess of Sussex, formerly known as Prince Harry and Meghan Markle, before their marriage five months ago. They are now on an 18-day tour of Australia, New Zealand, Fiji and Tonga, during which they have 76 engagements. The tour comes at an interesting time. In five months time, the United Kingdom is leaving the European Union. Almost fifty years ago, the country turned its back on the Commonwealth of former British territories; now, it hopes to revive the commercial and other ties it once had with these nations. 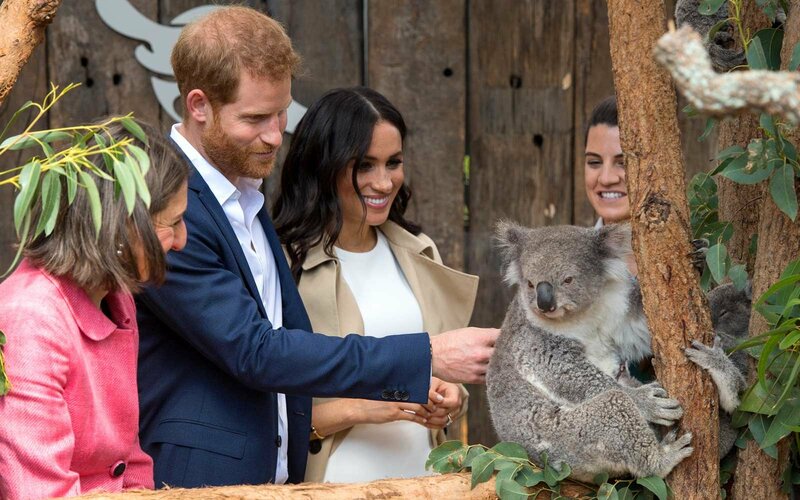 At the same time as the British are focused on Brexit, Australians are preparing for a plebiscite on the future of the monarchy in their country. With an election next year, the Labor (socialist) party is planning an immediate vote on whether to turn the country into a republic, not a republic American style but one where the titular head of state will no longer be a monarch who lives 10,000 miles away, but an Australian figurehead likely chosen by parliament. The American model is not likely to be adopted as it’s too expensive and politicians don’t like it as it’s too weak. One member of the Australian parliament warned against adopting the US system lest they, too, have a President Trump! Even republicans admit the change will lead to some confusion and political instability as 63 laws have to be changed, if the people vote for a republic. Any change will also be more expensive. Immediately prior to the arrival of the prince and duchess, the new Australian prime minister, Liberal (in Australia, that’s conservative) Scott Morrison, declared he is a monarchist and had the monarch’s portrait returned to the PM’s official office. His expressed view is that “if it ain’t broke, don’t fix it.” Australia’s founders chose to remain loyal to the Crown after achieving independence at the turn of the twentieth century. Australia’s constitutional monarchy and parliamentary system has been the envy of the world. It has attracted immigrants from all over the world, mostly, in recent decades, from failed states that happen to be republics; it’s likely that most of these immigrants, not knowing the past, will vote for a republic, setting Australia on the path to yet another dysfunctional state run by politicians for politicians. Before casting their vote, they would do well to watch the Australian documentary, “When the Queen came to town,” a record of the monarch’s first royal tour of Australia in 1954, with many interviews of those who remember the tour, in which 75% of Australians saw the monarch at least once. She was the first reigning monarch to set foot in the country. It was a highly successful visit. Britain’s entry into the EU, then the Common Market, on January 1st, 1973, contributed to the republican movement, as many Australians felt betrayed by the mother country, formerly their biggest trading partner. In November of 1975, more people turned against the monarchy when the queen’s representative, the Governor-General, Sir John Kerr, dismissed the socialist government of Gough Whitlam for financial improprieties. As this dismissal was “in the name of the Queen,” it boosted republican feeling. Australians gave the monarchy “the walkabout,” where members of the royal family walk amongst the people. This was named after an aboriginal practice. The term has caught on in the other constitutional monarchies, as well. It’s a great way for the people to meet their sovereign and other members of her family; and for them to show that they care about local issues. Politicians only show up at election time; Harry and Meghan are in Australia for the Invictus games and to promote growing concerns about mental health. Even with binoculars, we didn’t get to see the Queen or Prince Philip sixty years ago, but I do remember the crowds and the excitement. One other memory from about the same time was of the Queen’s visit to my hometown of Grimsby, a town on the estuary of the Humber. Again, crowds lined the street. I couldn’t see anything, but a man standing next to me offered to lift me up on his shoulders and my mother consented. From that vantage point, I remember a couple of people across the road fainted and the Red Cross was called to revive them. They were suffering from heat stroke (yes, even in England)! I remember, too, that my father, a republican (not to be confused with Republicans in the US), complained that he could not drive his car through the center of town, where all the crowds were. Ironically, he got the best view of the monarch as she passed by. It did not lead to his changing his mind on Britain’s constitutional arrangements. Perhaps Prince Harry and Meghan’s visit will help change the minds of those Australians who are tempted to step into the unknown with a questionable and uncertain republic. Australia, Britain, Canada, New Zealand, together with a number of small islands in the Caribbean and South Pacific, share a cultural heritage. A significant part of that heritage is the monarchy, which has provided each nation with a solid foundation and continuous, peaceful political and economic development. A change in the political system will mean a diversion from that heritage. First, abolish the monarchy, then change the flag, then something else until Australia becomes just another Asian republic – the kind of republic that new Australians have recently fled from! “Whether it was intended so or not, the decision by the Duke and Duchess of Sussex to choose Australia as the place to announce that they are expecting their first child was a public relations triumph. For years the royal family was criticised for having a tin ear when it came to reading and dealing with the public, but no one could say this now. The tone of the younger royals’ tour to the southern hemisphere has been one of approachability, without compromising the dignity of the positions which Harry and Meghan hold. “Their visit also runs counter to the conventional wisdom of some republicans — in Britain as well as Australia — that support for the monarchy is dependent on personal affection for the Queen and that the institution will be doomed upon her death. Now that Elizabeth II is, for reasons of age, no longer able to conduct long-haul tours, her grandchildren have achieved what her children never quite managed: to show that they have the ability to follow on and capture the support of the public where she leaves off.” (The Spectator, 19th October). The famous Washington Post columnist was brutally tortured and murdered in the Embassy of Saudi Arabia on October 2nd. What happened to him was reprehensible. It‘s not the first time that an Arab government has killed a critic. At the same time, we should also remember that Mr. Khashoggi was no friend of the West. His support of the Muslim Brotherhood and his close friendship with Osama bin Laden both illustrate this. A huge demonstration took place in London on Saturday, calling for a second referendum on Brexit. They oppose the United Kingdom leaving the European Union, scheduled for March 29th, five months from now. Referenda in the EU has often followed this path. A vote is taken on an issue, and when the result is not to the liking of the EU, a second referendum will be called for. Whereas the demand sounds reasonable, it could lead to further division in the United Kingdom, already seriously divided as it is. Those who want to Remain in the EU have concerns about leaving the world’s biggest trading bloc. If we bring in highly qualified immigrants to our workforce, we would be taking away from poorer countries the best they have to offer, and the situation in those countries will further deteriorate. The result will be an even greater flow of unskilled migrants escaping those countries. The proponents of the new multiculturalism want to share their welfare states with masses of refugees who — through no fault of their own — will be unable to participate in financing themselves for a long time to come. Multiculturalism was a term first coined by a Royal Commission in Canada in 1971. It was an attempt to show Canadians a way forward following a significant number of immigrants arriving from Africa, the Caribbean, the Middle East and Asia, peoples of different cultures from the dominant culture of Canada. The policy was adopted by Canada and then other western nations. It has not worked well and will lead to further problems ahead. Jesus Christ prophesied that, at the time of the end, “Nation will rise against nation, kingdom against kingdom” (Matthew 24:7). The word “nation” comes from the Greek word “ethnos,” from which we get the word “ethnic.” Ethnic conflict will be common at the end time. Indeed, it is already, arguably, the biggest cause of conflict around the world. “And He has made from one blood every nation of men to dwell on all the face of the earth, and has determined their pre-appointed times and the boundaries of their dwellings.” God set the boundaries; man (mainly western man) is behind mixing, which is the opposite. We see many problems with multiculturalism. Tolerance is required for it to work, but this is sadly lacking in some groups. Rising conflict in many nations is leading to the rise of populist movements that want to preserve one culture over others. None of this means that any race is superior to another. People simply want to preserve their own cultural heritage. Some cultures are just not compatible. Comments I have made on the threats from immigration are based on this reality — that the mixing is going to lead to negative consequences. It is not meant to imply that any race is superior. “As 4,000 Honduran migrants push north toward the US, President Trump sees an opportunity to help Republicans hang on to the House in the midterm elections.” (Axios, 20th October). “Throughout this study two related concepts have been mentioned repeatedly: authority and government/governance. We have seen Herbert W. Armstrong imposing his authority, diminishing his son’s authority. Having his authority challenged, using his authority to change long-held doctrines, and being accused of authoritarianism. We have seen Joseph W. Tkach and Joe Jr. making use of the strong ethos of obedience to top-down authority in the Worldwide Church of God to revolutionize its teachings, thus precipitating the three major schismatic moves of 1989, 1992-3, and 1995. We have seen various attitudes to authority in the offshoot churches, from the hardline position of Philadelphia, Restored, and others to the more liberal attitudes found in United and its smaller offshoots and in the GTA group of churches.